Space for Seven: Ford Flex | Donley Ford Lincoln of Mt. Vernon Inc. When it comes to the 2018 Flex, Ford has redefined the image of a seven-passenger vehicle. The 2018 Ford Flex is big on space. 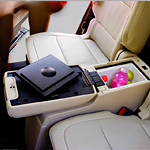 Seven seated passengers can all enjoy the comfort of a roomy cabin, including ten cupholders located throughout the Flex’s cabin. The Flex is easy to get into and climb out of, thanks to its low ground clearance. And the available PowerFold® third-row seat makes accessing the Limited trim’s 83.2 cubic feet of cargo space a breeze. With the simple press of a button, the PowerFold® third-row seat folds for a flat load floor and additional cargo space. When the third row is in the upright position, it seats two comfortably. Storage is conveniently placed throughout the Flex, whether in the first-row console or the first- and second-row door pockets. The third row wasn’t left out and also offers storage in the armrests. Visit us at Donley Ford Lincoln of Mt. Vernon Inc. to experience the space and storage of the Flex today!